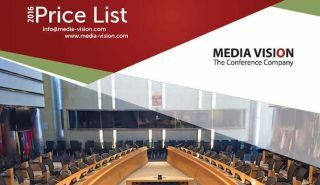 An updated Media Vision price list is now available to authorized dealers, including the full range of TAIDEN conference and interpretation systems, as well as Media Vision’s new assistive listening and multichannel streaming and recording solutions. Prices for the TAIDEN HCS-5300 digital infrared wireless conference system have dropped with the release of the new generation series featuring key upgrades, such as web-control capabilities and wired/wireless microphone combining ability. The solution is popular for using digital infrared technology to prevent RF interference and ensure meeting confidentiality, and it offers flexibility with room combining capability of up to four meeting spaces. The new price list also includes Media Vision’s assistive listening product line, first introduced in February. The assistive listening system by Media Vision provides the complete feature package for wireless FM listening devices in assembly areas, allowing facilities to meet ADA requirements at a competitive price. The solution includes stationary transmitters, including a Dante-enabled version, as well as portable transmitters that can be used for tour group applications. Other noteworthy additions in this new price list include the Attend Sixteen solution for video streaming and recording with multiple audio tracks, more flush-mount and microphone-array options on the TAIDEN line of touchscreen multimedia and video monitor terminals, as well as a new interpreter console, which incorporates advanced intercom options and more flexibility for working with video devices.